A conversation that I had with one of the vendors at the recent NRAAM in Nashville got me thinking about traveling with firearms. Although certainly not a member of the jet set, I do a fair amount of traveling for work and pleasure – much of it on commercial airlines – and I often take a firearm with me. Whether it is for business, family vacation, a relaxing getaway, a big hunt, or something else, plenty of people find themselves flying around the US. Last year alone, scheduled commercial flights carried nearly 663 million domestic passengers. One can’t help but figure that it is a safe bet that some of those flyers were CCW-ers, hunters, or otherwise among the many millions of firearm owners in the US – and many of them probably took their firearms with them. So… how do they do it? Read on to find out but, first… an obligatory note. When traveling with firearms, be certain to know, be familiar with, and comply with any and all local, state, federal, or international laws in effect at your place of departure, destination, and anywhere you may be stopping along the way. Step 1: Don’t be this guy. In fact, don’t be any of the doofuses we read about in the news that tried to bring a gun onto an airplane on their person or in their carry-on. That isn’t how this works. Your firearm gets checked and rides under the plane with the rest of the luggage. If you travel with firearms often, check, double check and triple check your carry-on bag to make sure you don’t have a firearm, ammo, gun parts, etc. in there. Neither the TSA, the local cops, nor the judge will find it amusing that you “forgot it was in there.” Rest assured that it wouldn’t be the first time they have heard that line. Realistic replicas and toys, starter guns, receivers or frames, silencers, destructive devices, and “any weapon which will, or is designed to, or may readily be converted to expel a projectile by the action of an explosive” are prohibited in your carry on and must be checked. Certain firearm parts are prohibited as well – I’ve been sent back to the gate to check a bag that contained an AR-15 trigger group. Note, however, that rifle scopes are specifically exempted and may be carried on board. Thank goodness – have you seen how the “throwers” treat checked bags? Travelers may only transport UNLOADED firearms in a locked, hard-sided container as checked baggage. The container must be completely secured from being accessed. All firearms, ammunition and firearm parts, including firearm frames, receivers, clips and magazines are prohibited in carry-on baggage. Your firearms and ammo can either travel in their own separate case or, if it fits, in a case inside of another piece of your luggage. Obviously, the latter option can be difficult for long guns. We have had great luck using Pelican cases with custom foam from MyCaseBuilder; our firearms always arrive safe and sound and they certainly meet the TSA requirements. All firearms must be declared to the airline during the ticket counter check-in process. The firearm must be in a hard-sided container that is locked. Firearm magazines and ammunition clips, whether loaded or empty, must be securely boxed or included within a hard-sided case containing an unloaded firearm. Small arms ammunition may be carried in the same hard-sided case as the firearm, as long as it follows the packing guidelines described above. Travelers must securely pack any ammunition in fiber, wood or metal boxes or other packaging specifically designed to carry small amounts of ammunition. TSA prohibits black powder or percussion caps used with black-powder. The TSA rules are pretty clear, with only a few “gotchas” that trip up some people. The biggest one is about locks and cases. The simplest way to explain this is that you are the only one allowed to have access to your firearm. This means no “TSA approved” locks, no giving out your combination or key to the baggage handler or anyone else. If the bag needs opened, either you open it or it is opened in your presence and you get the key back as soon as it is closed. The photo at left, from the TSA website shows a case that would not meet their guidelines since someone could get their finger into the case to pull it open. Each airline will handle the check-in and declaration process slightly differently and may have their own guidelines (see below) but, for the most part, the process should be about the same. With your unloaded firearm securely cased in your checked bag, inform the airline ticketing agent (the person at the counter where you check in) that you “would like to declare an unloaded firearm in your checked bag.” FYI, loudly saying “I have a gun!” is not the right way to go about this. They will give you a form to fill out swearing that the firearm is unloaded and packed according to TSA and airline guidelines. The form will be placed with the firearm and your case will be sent through to security. It must be noted that not only should your bag not indicate on the outside that it contains a firearm, but it can not indicate such. As with all airline luggage, your luggage containing the firearm must undergo security screenings. The screening process may range from you being led to a secondary security area to have the bag inspected in front of you (in which case they can have you open the case if needed) to you waiting in the ticketing area for a period of time (usually 10-15 minutes) in case there are any issues (in which case they will page you to come open the case). Per the TSA website: “If a locked container containing a firearm alarms, TSA will contact the airline, who will make a reasonable attempt to contact the owner and advise the passenger to go to the screening location. If contact is not made, the container will not be placed on the aircraft.” You can see why it’s important to stick around and listen for your name on the PA system. How you retrieve your firearm luggage when you reach your destination can also vary by airport or airline. Your luggage may come out on the carousel with the rest of the bags, airline personnel may bring it directly to you, or you may have to retrieve it in person from the airline’s baggage office. If in doubt, you can ask an airline gate agent or customer service agent what the normal procedure for that airport is. Your best bet might be to wait near the front of the carousel to grab your luggage as soon as it comes off and, if it doesn’t show up there, go to the baggage office. As mentioned above, various airlines have their own policies which may or may not be more strict than the TSA guidelines. Be sure to check your airline’s policy as close to your travel date as possible to make sure that you are operating under the most recent rule set. One shotgun case with shotguns; or One pistol case with pistols, noise suppressors, one pistol telescope and small pistol tools. No limit to the number or type of firearms (rifles/shotguns/pistols) per case. Different firearm types may be in the same case as long as each type is properly packed. Total ammunition weight allowance depends on flight number. American Airlines – You can carry an unlimited number of cases and in each case, you can carry tools, shooting mats, noise suppressors and up to: 3 rifles or shotguns; 5 pistols or revolvers; 11lbs / 5kg of ammunition (per passenger). Regular baggage and oversize / overweight charges may apply. Ammunition must be in the original packaging from the manufacturer, fiber, wood or metal boxes, or other packaging specifically designed to carry small amounts of ammunition. Delta – Pistols and accessories must be included in one case and contain: Pistol telescopes; Noise suppressors; A small pistol tool case; No more than 11 lbs. (5 kg) of ammunition, including case. Rifles and shotguns must be packaged as follows: One hard sided case containing up to four rifles, shotguns, shooting materials, tools; One hard sided case containing up to five handguns, one scope, tools; One bow and quiver of arrows and maintenance kit enclosed in a case or container strong enough to protect the bow and quiver from accidental damage; No more than 11 lbs. (5 kg) of ammunition, including case. An excess baggage fee will apply if checking more than one gun case. Frontier – One passenger is allowed to check up to 11 pounds of ammunition. All ammunition must be securely packed in either the original manufacturer’s packaging, a fiber (such as cardboard), wood, or metal box, or other specially designed packaging. Ammunition may be packed in magazines or clips if the exposed portion is covered or sealed (i.e. sealed with duct tape), or the magazine/clip is placed in a pouch, holder, holster, or lanyard. 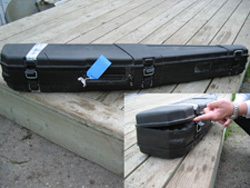 Ammunition may be packed in the same hard-sided, locked, firearm case, provided it is packed as described. Please allow an extra 30 minutes for check-in. JetBlue – There is no additional charge or limit for checking shooting equipment. However, one piece of shooting equipment will count as one of your checked bags. Ammunition for the firearm cannot be placed in the same container as the firearm, but may be in the same checked bag as long as everything is packaged properly. Ammunition must be housed in a separate container that is completely separate and distinct from the firearms locked box. Ammunition is limited to 10 pounds per customer. Southwest – A firearm in a hard-sided, locked container may be placed inside a soft-sided, unlocked suitcase. 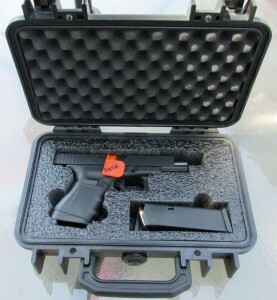 A firearm placed inside a hard-sided, locked suitcase does not have to be encased in a container manufactured for the transportation of firearms. Firearms will count toward the two-piece free baggage allowance. Multiple firearms may be transported inside one hard-sided case. Ammunition may be placed in the same container as the firearm and must be securely packed in cardboard (fiber), wood, or metal boxes, or other packaging specifically designed to carry small amounts of ammunition. Customers are limited to 11 pounds gross weight (ammunition plus container) per person. Magazines or clips containing ammunition must be securely packaged (placed in another small box or in a secure cutout in the carrying case, in order to protect the primer of the ammunition). United – United accepts one item of shooting equipment per customer as checked baggage. 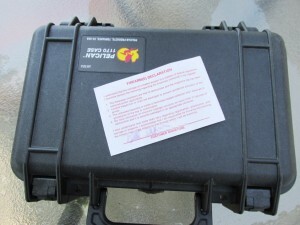 One item of shooting equipment is defined as one hard-sided shooting equipment case containing up to five firearms, with or without scopes, and up to 11 lb. (5 kg) of ammunition. US Airways – Checked ammunition may not exceed 11 lbs/5 kg per person. Ammunition clips with ammunition loaded are not accepted. There is no limit to the number of items contained in rifle, shotgun or pistol case, up to 50 lbs/23 kg, 62 in/157 cm in maximum. Virgin America – One item of shooting equipment is: One rifle case containing not more than two rifles (with or without scopes), one shooting mat, noise suppressors, and a small rifle tool set; One shotgun case containing not more than two shotguns; One pistol case containing not more than four pistols; One bow, a quiver of arrows and maintenance kit enclosed in a case or container of sufficient strength to protect the content from accidental damage. Small arms ammunition for personal use may be carried in checked luggage if securely packed separately from the firearm in fiber, wood, or metal boxes, or other packaging specifically designed to carry small amounts of ammunition. Virgin America will allow up to 10lbs of small arms ammunition per guest. Although there are strict guidelines for traveling with firearms, the entire process is not difficult. If you have not done it before, you may be unnecessarily anxious about the process. Just relax, make sure that your firearm is securely packed and locked up in a strong case. The airport security screeners and the airline ticketing agents and baggage handlers have seen plenty of properly cased and declared firearms come through in checked bags and the process is easy, straightforward, and smooth. Follow these rules and have a safe, enjoyable trip. Feel free to share your firearms travel stories or questions in the comments below.